If you're fortunate enough to have a spare bedroom in your home that hasn't been claimed as an office or guest bedroom, considering turning it into a music room. A place where you can put on your headphones and maybe for just a few minutes out of the day find peace and unencumbered relaxation. Perhaps you play an instrument as well, perfect for a music room, as a custom wall mural is inspiring as well as beautiful. The custom wallpaper design shown is a fun homage to stage lighting. Though the light effects in the mural have been modified from their original photographic state, they still give the mural the feeling of being creatively illuminated. This wall mural image seems as if it is taken from the bleary-eyed perspective of an engrossed fan at a concert. With the wall mural intimating a sense of stage lighting, your speakers set out in front help to bring the faux stage aesthetic full circle; what would any well lit stage do without massive stacks of speakers in the forefront? 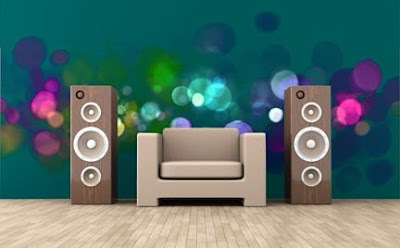 Perch upon your favorite chair and enjoy your favorite instrument in front of your live concert inspired wall mural; to your friends and family you'll have the look of a professional performer on stage, and your very own music room will be the space where all your rock and roll fantasies come true. Trevor, email us at info@greatwallonline.com and we'll assist you. Thanks!